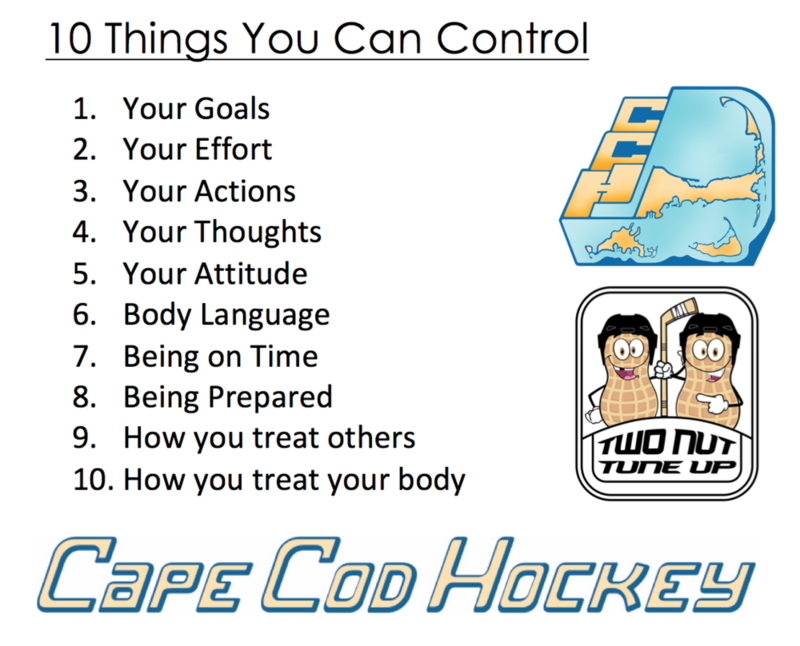 Understanding what you control is a very important aspect of being a successful athlete. When you fully grasp and hold tight to what you can control, and learn how to let go or block out what you can’t, you’ll find yourself on a much more focused and productive path. You’ll be intent on getting better. By understanding that you need to control your thoughts, actions, and body language, you’ll set yourself up for success on your next opportunity. No coach or teammate wants to see someone looking down, or feeling bad for themselves. If you see someone on your team demonstrating poor body language lift them up! It’s your job as a member of the team to look out for your brothers or sisters and make sure they are controlling what they can control. Hockey is a game of mistakes, you’ll make thousands of mistakes throughout your years as an athlete. Guess what? They don’t matter as much as you think. What matters isn’t the mistake, it’s how you react to that mistake. Do you slam your stick? Or blame others? Or, do you take a breath and analyze the situation to try and do your BEST to fix your mistake. That’s all a coach can ask for, no one is perfect. Understand your mistakes don’t define you, it is the moments following your mistakes that do. A few more easy “controllables” that can help your athletic career are, being prepared, being on time, and treating your body the way it should be treated. What does it mean to be prepared? It means you went to sleep at a reasonable hour the night before a game or practice. It means you had nutritious meals leading up to your game that is going to give you the fuel you need to preform you best. It means you arrived at the rink early to get mentally focused. Ice isn’t free or cheap, the worst thing a hockey player can do is waste their time, or their teammates time on the ice. In soccer or basketball for example, the practice venue can easily be free. Those athletes don’t need to pay to shoot basketballs at the local park, or kick the soccer ball around with their friends at a local field. So when you are on the ice remember that every second is extremely valuable. Effort comes from within. You control exactly how much effort you put forth each day. One small example is finishing the drill to the end. Many players will stop skating before they reach the end of the drill because no one is watching them. By doing this you cheat your coach, your team, but most importantly you cheat yourself out of getting better. If you make that a habit you are limiting your growth as a player and will never reach your full potential. Great players don’t become great by cutting corners or cheating when the coach isn’t looking. Great players give it their all whether there are 20,000 fans watching the game, or if they’re alone in their driveway shooting pucks. If you want to be great, you have to put in the effort. I was always told that the measure of a person isn’t how they act when people are watching, it is how they act when no one is around. Attitude is a huge part of hockey and life. Having a positive attitude can take you a lot further than a negative one. Would you rather be around someone who is happy, constantly building up the confidence of the people around them, and is focused on bettering themselves as well as the team? Or the opposite? 10 out of 10 people will go with the former of the two. Coaches have an easy decision to make when a player has a bad attitude. Scenario: Player A and Player Z are equally talented players. They have the same work ethic and contribute on and off the ice equally. There is only one spot left on the team and the decision has to be made to choose either Player A or Player Z. Player A shows up every day with a smile, has a positive outlook on each day, is well liked by his teammates, and treats people with respect. Player Z shows up miserable to the rink, has poor body language, and does not speak to his teammates very often. Who do you think the coach will choose? Does he have a difficult decision to make? Absolutely not. If you think its Player A you are 100% correct. It is so important to bring these intangible things to the rink each day if you want to continue to advance your hockey career and make teams at a higher level. How you treat others. The hockey community is a small one. It may seem big when you are young but as you get older you will realize that it is smaller than you think. Coaches talk to coaches, parents talk to parents, and players talk to players. As soon as you have a poor reputation it sticks with you and is very hard to change. It is so important to treat everyone with the respect they deserve. Your parents, your coaches, your teammates, the rink staff, the parking attendant, etc. Everyone that you come in contact with throughout your day should be treated the same way that you would want to be treated. Offer help to someone in need, if you know a teammate is doing something right let them know they’re doing a good job, make an effort each day to practice this habit and it will pay off in the long run. Goals. You set goals each day, month, and year. You want to make that elite team, you want to play in college, you want to be a leading scorer on your team… These are all goals that you set. If your goals are big and they scare you, that’s great! No one has to know your goals, you can keep them to yourself, but if you want to achieve those goals and reach your full potential you need to set them in your mind first and foremost. Put your goals above all else, make them a priority. If your goal is to make the A team next year, do you think you should spend your entire day inside playing video games or do you think you should be stick handling in your basement working on getting better? If you are consistently thinking about your goals they will naturally become the most important part of your life. If your goal is to make a college or professional roster one day you will need to make sacrifices. You won’t be able to do everything your friends are doing all the time because you have goals and they are not going to come easy. Do what you need to do to give yourself the best possible chance of achieve your goals. Hopefully you found one of these paragraphs helpful and can focus more on what you can control!